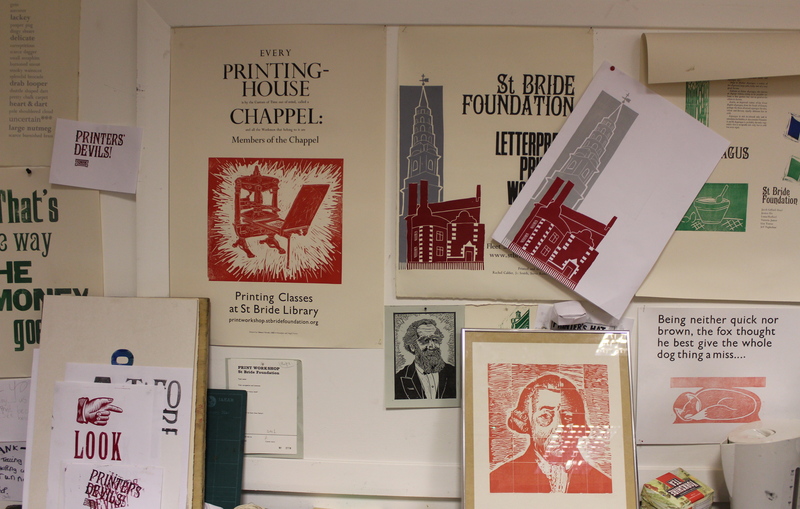 In the shadow of St Bride’s Church lies a gem of London’s printing history – the St Bride Foundation. 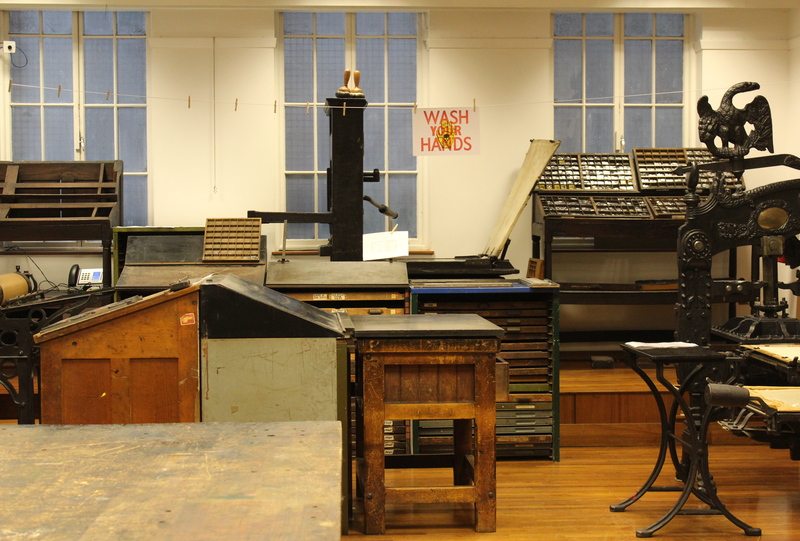 The Foundation started life as an educational, social and cultural centre for local printers and students – and it would be hard to imagine a more fitting location given its proximity to Fleet Street. 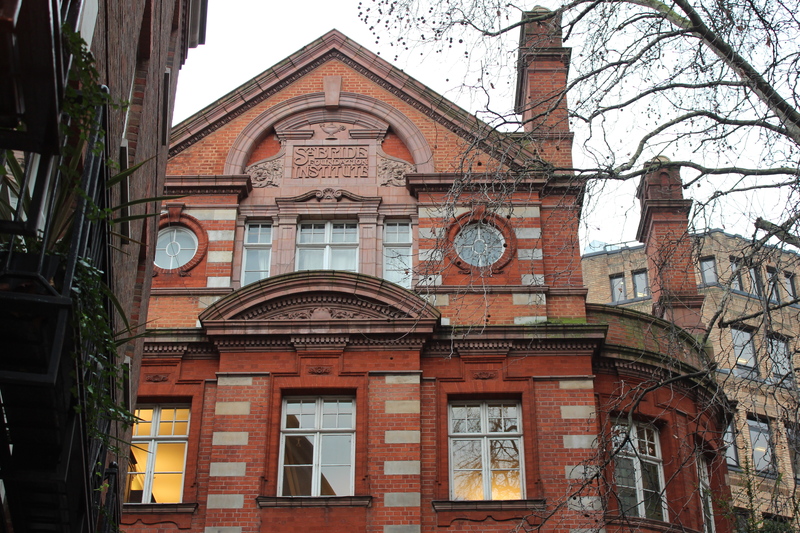 The 1894 red-brick Victorian building tucked away down St Bride Lane – no stranger to transformations while still retaining its print-based heritage, as we shall see – now contains a print workshop, library and theatre. 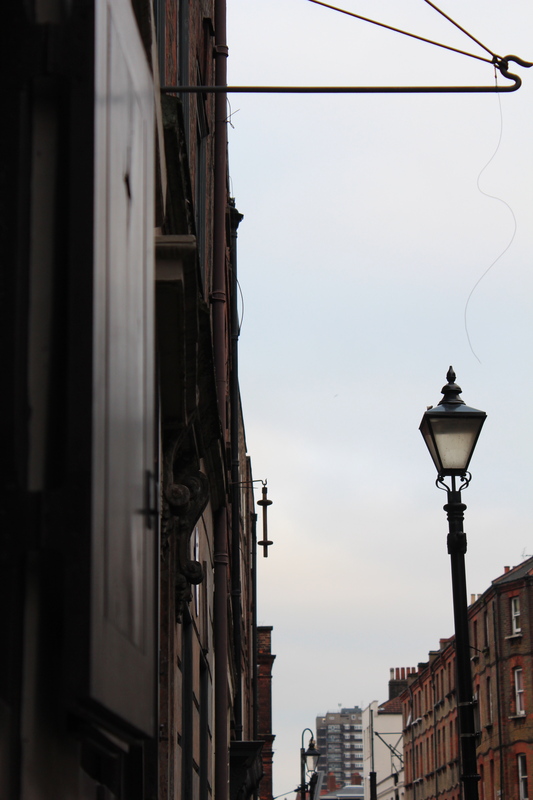 As the door to today’s print workshop opens, you are swiftly transported back to the days of the dominance of the printing presses via the strong smell of ink that permeates the space. This is a most atmospheric place – once the Foundation’s gymnasium – with its old presses lining the room. The oldest is a Common Press machine, whose frame possibly dates back as far as the 16th century. A compositor’s case from Oxford University Press in the corner dates from 1668, the extensions attached to its legs a testament to the ever-growing height of the human race. 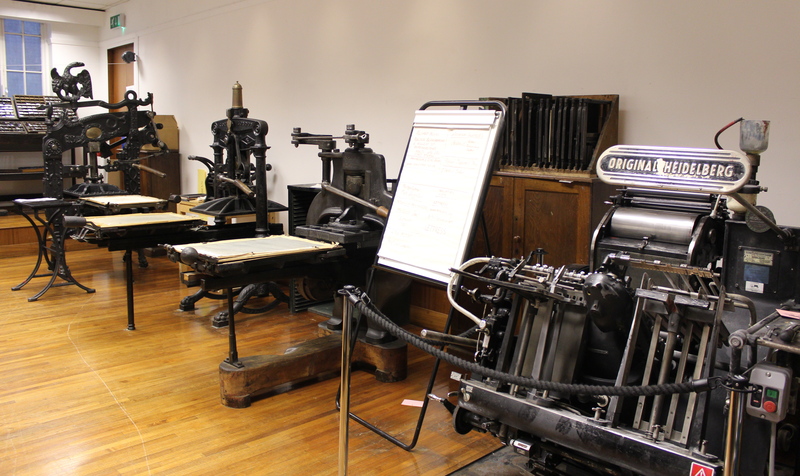 Classes in traditional printing techniques are held regularly in this room, including in letterpress (Monday nights), wood engraving (Thursday nights) and the Adana platen press. 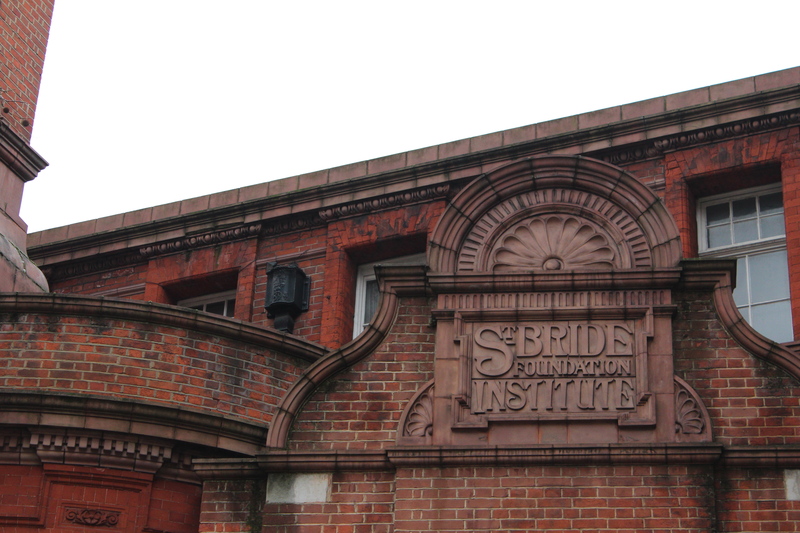 The Saint Bride Foundation Institute Printing School later evolved into the London College of Printing, now the London College of Communication – today its students return to St Bride to learn the traditional forms. 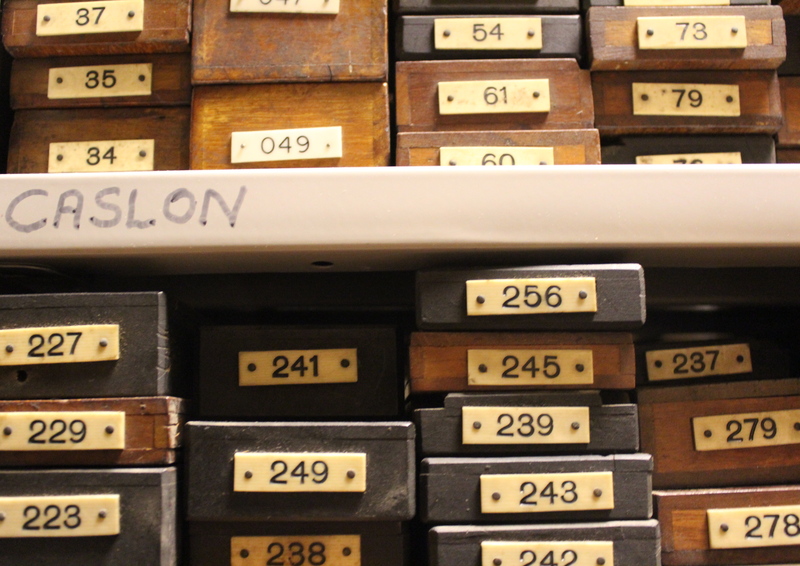 Upstairs, the St Bride Library’s storage area is a treasure trove of printing goodness. 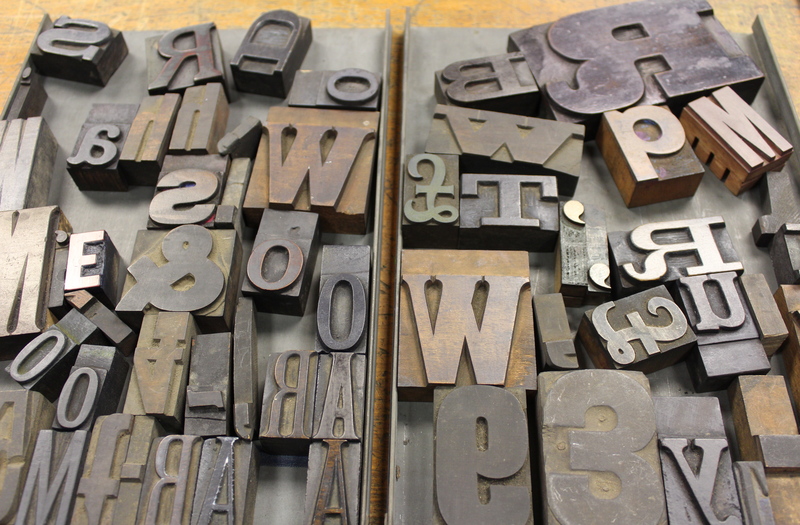 Surprisingly beautiful wood blocks and the Caslon Collection of type punches share shelf space with broadsheets, books and journals. The Library holds over 50,000 books, and specialises in printing, graphic arts and related fields. They also have a strong events programme. 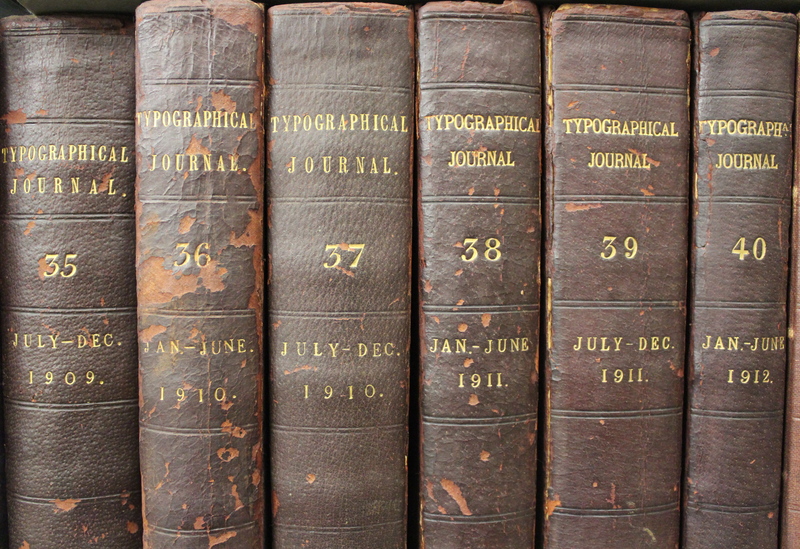 The Library’s small reading room, once the lithographic printing room, is open to the public each Wednesday, and individual appointments can be arranged on Tuesdays and Thursdays. A number of other rooms – including the lovely old Printing Library – are now available for events and conferences. Bridewell Theatre was built over the swimming pool – believed to be the first public pool in the area – which remains in situ today underneath the wooden flooring. Its towel laundry was converted into the bar. Other such transformations continue apace today, with a new book binding workshop and exhibition space currently being created near the print workshop. Last week the Londonphile had a superb day out getting up close and personal to the Old Royal Naval College’s Painted Hall. 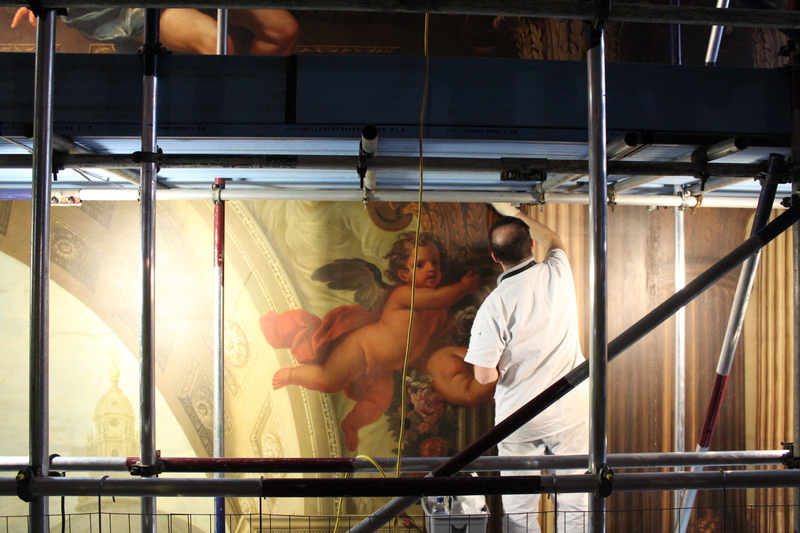 Right now this Baroque gem is getting a bit of a clean-up, with conservators tackling 50-plus years of accumulated grime. They’re working on the west wall first, with a deadline of the end of April. 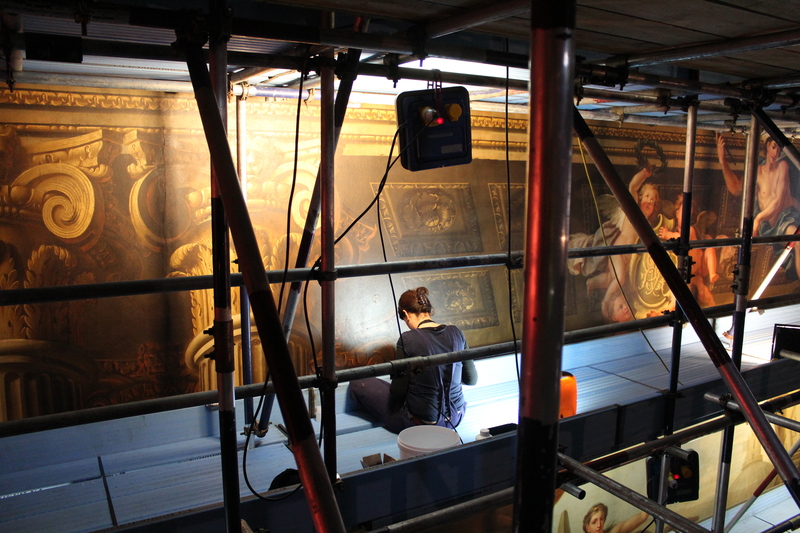 So while normal visitors to the Painted Hall will find that area covered over (with a very realistic-looking copy of the painting), those booked onto the conservation tours the ORNC is currently running can go behind the scenes, meet the conservators and get a truly bird’s eye view of James Thornhill’s masterpiece. 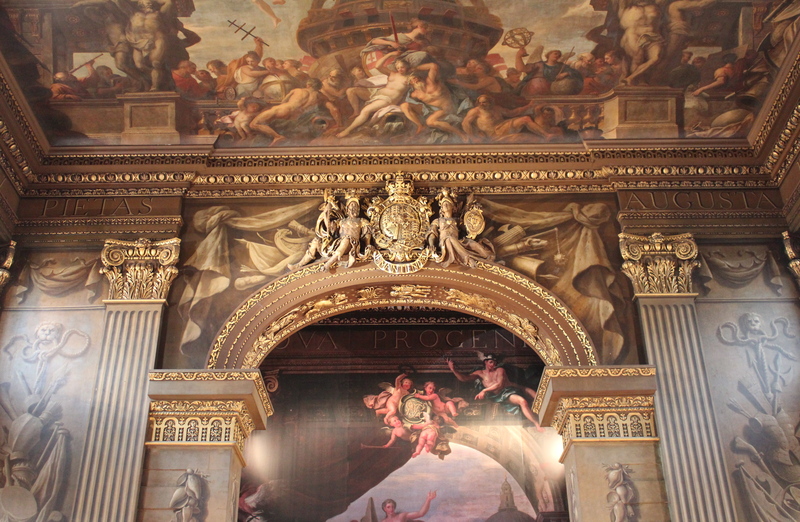 The Painted Hall was designed by Wren and Hawksmoor in 1698 and was originally intended to be a dining room for the naval veterans who lived here at the Royal Hospital for Seamen. Thornhill took a staggering 19 years to complete the elaborate painting of its interior. It was soon decided that the hall was much too grand for its original purpose and it quickly turned into one of London’s first paying tourist attractions. 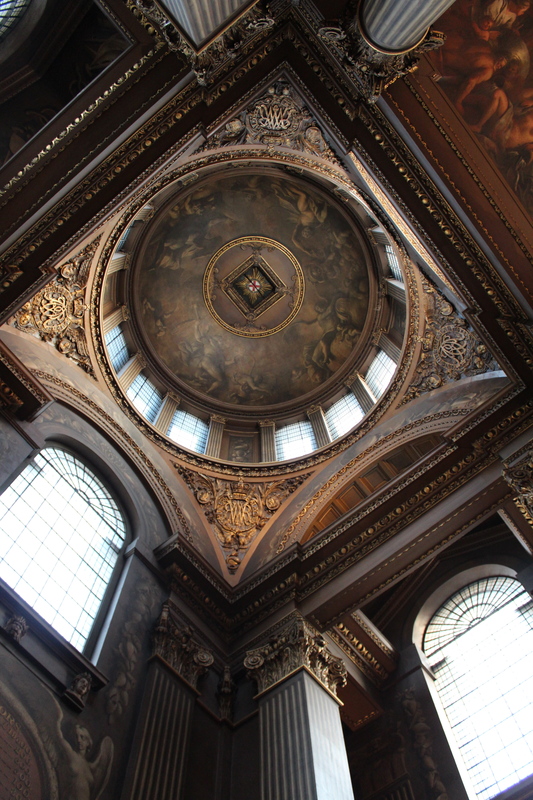 Today you can visit the hall for free – and I personally believe that it is one of London’s most under-appreciated gems. 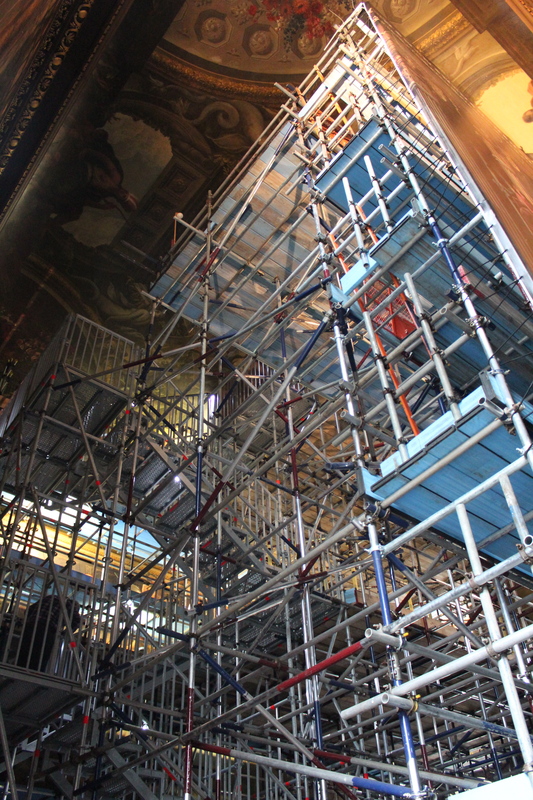 Stepping behind the cover hiding the west wall on a Meet the Conservators tour, you first encounter the very large – and high – scaffolding which the conservators are using to restore this massive work. 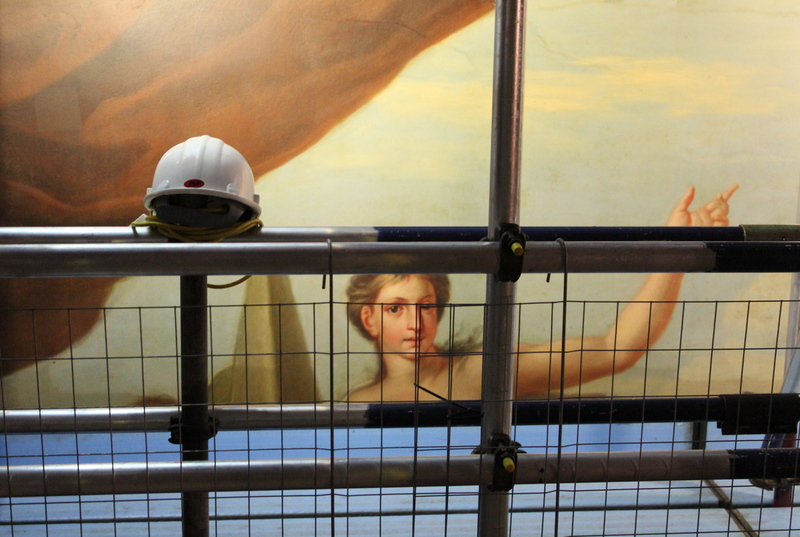 Work began on December 3rd – this is actually the tenth restoration of the hall, the first being just five years after it originally opened. 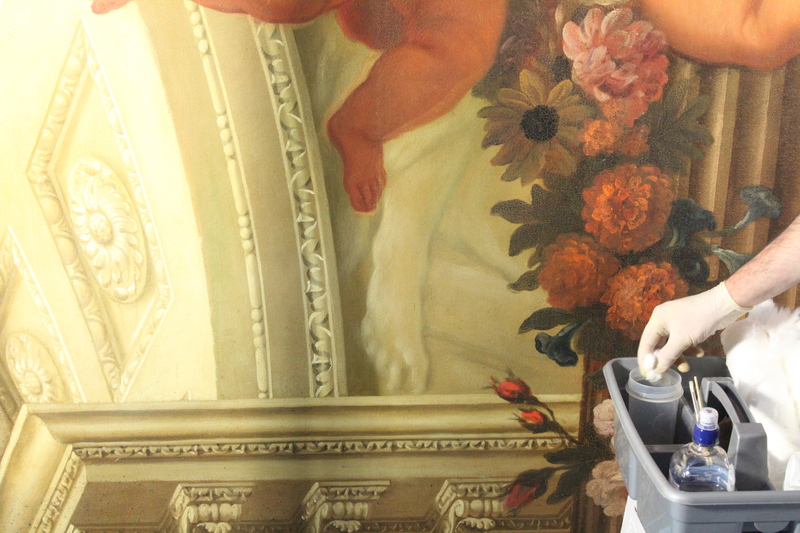 The most recent restoration was undertaken in 1957 and saw 15 layers of varnish removed. The work was conducted to such a high quality that the thinly-applied varnish layer from that time will now be retained, while a thorough cleaning is undertaken, primarily using cotton wool swabs and water. It’s quite a thing to ascend the scaffolding and see the west wall up close. We first climbed six metres to the first visitor viewing platform, where we had a talk from a conservator and watched another at work at close hand. 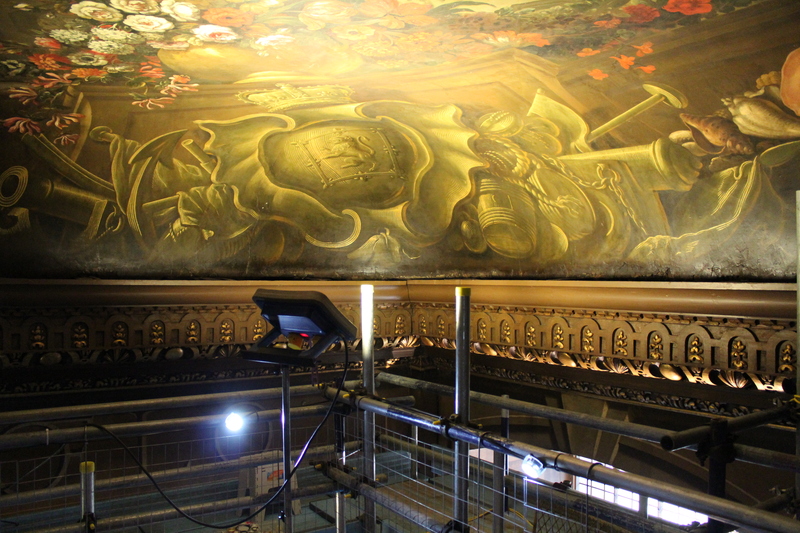 We then moved to the second platform, at ten metres high, which was almost within touching distance of the Painted Hall’s ceiling (see below). These tours provide such a unique opportunity – it’s hard to imagine when visitors will have another chance to see the hall from such a viewpoint. And they’re free! 19 Princelet Street seems a fitting place for an immigration museum given its layers of history that follow patterns of immigration in the local area. Last week the house held two rare open days – due to its fragile nature it is not yet able to be open to the public on a more regular basis. Funding is desperately required for repairs to the Grade II listed property so that its Museum of Immigration and Diversity can be fully realised. 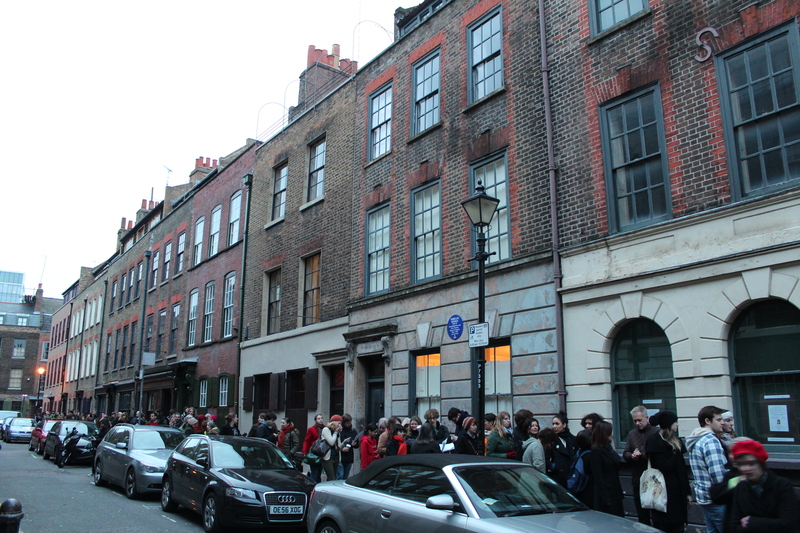 The Londonphile attended the second opening, and the queue stretching all the way back to Wilkes Street would suggest that number 19 has a bright future. 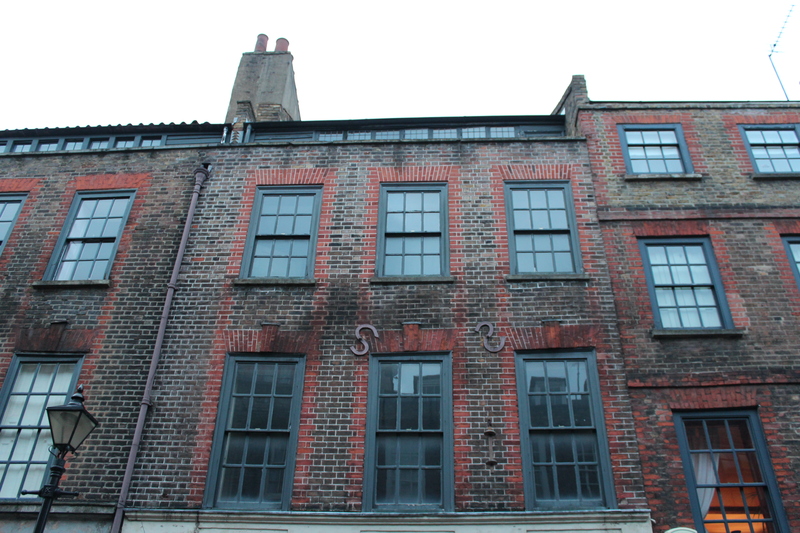 Originally built in 1719, this five-storey building was home to the Ogier family, French Huguenot silk weavers. 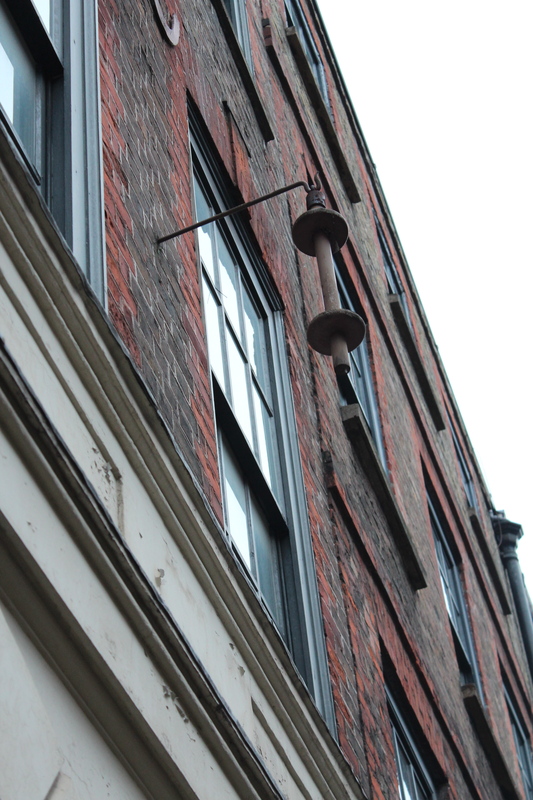 A metal bobbin hangs outside the building today as a lasting reminder of the weavers’ presence in the house. 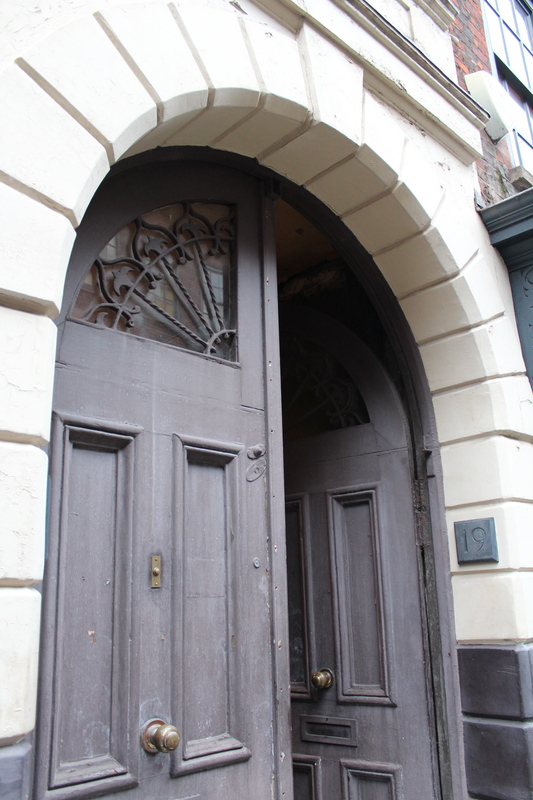 After a number of years housing various workshops and lodgings, 19 Princelet Street underwent its most significant change with the building of a synagogue in 1870 by a group of mainly Polish Jews, working together under the banner of ‘Loyal United Friends Friendly Society’ to create a community centre. While the synagogue now comprises the major part of the building, this part of the structure was in fact where the Ogiers’ garden once stood. Metal vents in the synagogue floor allow glimpses down to the meeting room built below the synagogue – this downstairs area was also open, along with a kitchen underneath the original house. Upstairs we had access to some of the the women’s gallery in the synagogue, with its lovely views across the space. The floor above that was closed to visitors but now functions as a staff area, while the attic room of mysterious scholar/recluse David Rodinsky – made famous by artist Rachel Lichtenstein’s 1999 book Rodinsky’s Room – is well out of bounds due to structural issues. One of the volunteers told me she had been involved with the charity for ten years and still hadn’t seen it. Due to the property’s no-photography rule you will have to imagine the crumbling beauty of its interior for yourself. But it is beautiful, and hopefully the Spitalfields Centre charity will be able to generate the funds needed to preserve and restore this lovely building and turn it into the museum of their vision. And the best news is that more open days are already planned for March 2013: on Sundays 17th & 24th March, 2-4pm, and what is sure to be a lovely evening opening on Thursday 21st March, 5-8pm. 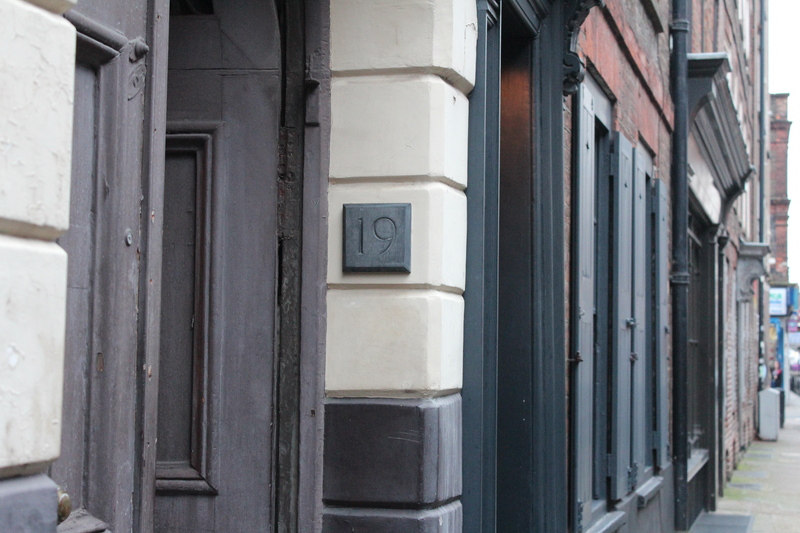 For more details visit 19 Princelet Street’s website.